Hello Beady Friends! Leah here from Eureka Crystal Beads.com! With how well the Bead Challenges are going over, let’s march on into December with another! December Beading Challenge Theme: ‘Tis The Season! I’ll be giving you some product ideas below, but feel free to use whatever you have in your own stash! Take some inspiration from my ideas or come up with your own! This challenge is all about pushing yourself to work within a theme, but most of all – HAVING FUN and ending up with a beautiful creation to wear with PRIDE. ***If you’d like to share, I’d love to see what you come up with! Feel free to send a picture of your finished piece(s) (or even unfinished pieces! This is no pressure, right?) over to me via Facebook Messenger on the Eureka Crystal Beads Facebook page! Make sure to let me know if it’s ok for me to share your picture(s) – we plan on putting up a fun album with all your ‘Tis The Season projects at the end of the month! Ok, here are my Inspirational Selections for our Challenge Theme! Swarovski Crystal color SCARLET is an amazing red, my favorite red that they make, actually. Sure, Siam and Light Siam are fantastic as well, but I think Swarovski truly came up with a stunning shade last year when Scarlet was introduced to the line. If you truly want to see it in holiday action, check out these 4mm Swarovski Crystal bicone beads in Scarlet AB!! 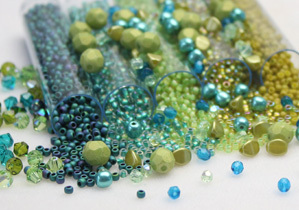 We also carry a lovely selection of bead mixes that are sure to inspire you for this bead challenge!! Do you love working with Delicas? These mix names may not be super holiday-ish but that doesn’t mean they wouldn’t be stunning this month!! Curtain Call, Jester, Snowfall (ok this one has an appropriate name…), and Troy … Check ’em out! Want a stunning focal that’s sure to inspire you for this holiday season? Check out this AMAAAAAAZING (Yes, it’s deserving of all those “A’s”) Vintage Swarovski Crystal Pendant! Not only would this look simply stunning just hanging up for the holidays as decoration or on your Christmas tree, but it could also be a spectacular focal pendant among the rest of your necklace design! Next Post DECEMBER BIRTHSTONE: TURQUOISE!